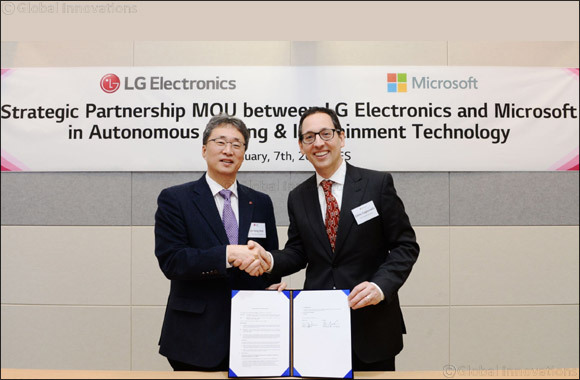 Dubai, UAE, January 09, 2019: LG Electronics (LG) and Microsoft entered into a memorandum of understanding to enhance and further grow LG's autonomous vehicle and infotainment system business. Under the terms of the partnership, LG will accelerate the transformation of its existing digital platform for the vehicle industry, seen as key growth engines for the company, by leveraging Microsoft's Azure cloud and artificial intelligence technologies along with LG's future self-driving software. LG will apply Microsoft's AI knowhow to its Advanced Driver Assistance Systems (ADAS), Driver-Status Monitoring Camera (DSM) and Multi-Purpose Front Camera products and incorporate Microsoft's Virtual Assistant Solution Accelerator in LG's infotainment systems. And with Azure Data Box service, data captured on the road can be uploaded automatically to create a library that helps the self-driving software grow even smarter. In addition to its ability to train AI self-driving software, Azure also has a voice-enabled Virtual Assistant Solution Accelerator with its AI services. With help from Azure, LG's vehicle infotainment system will allow drivers to easily and quickly check traffic conditions on the road, search for nearby restaurants, call up favorite songs and more.